JOHANNESBURG (AP) -- The Nigerian Stock Exchange became a full member of the World Federation of Exchanges on Tuesday, just as it prepares to woo Asian fund managers. It's taken three years for the West African exchange to win approval based on proper regulation by bodies including the Securities and Exchange Commission of Nigeria, the Central Bank of Nigeria and the Central Securities Clearing System. The federation sent an assessment team to Nigeria last month and the Nigerian Stock Exchange announced in a statement that it received a unanimous vote for admission as a full member at the general assembly of the federation Tuesday in Seoul, South Korea. CEO Oscar Onyema said it is a step forward in the Nigerian exchange's integration with global financial markets. The exchange's head of strategy, Yvonne Emordi, said "It sets the tone for the upcoming Asia tour the Nigerian Stock Exchange will kick off in early December this year, to introduce our market to Asian fund managers with frontier and emerging market investment strategies." The federation is a global trade association for operators of regulated securities exchanges that Onyema called "an important reference for international investors." 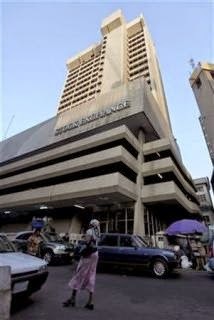 The main board of the Nigerian Stock Exchange currently lists 190 equities with a market cap of more than $83 billion. The membership comes the same year Nigeria, Africa's biggest oil producer and its most populous nation of about 160 million, rebased its economy to overtake South Africa as the largest on the continent. The Nigerian exchange is only the fifth in Africa to join the federation. The others are based in South Africa, Egypt, Morocco and the Indian Ocean island of Mauritius.